I’ve never seen Ultraviolet Hippopotamus but have heard good things. I really like the upbeat sound of the album embedded below. Ultraviolet Hippopotamus carves themselves a niche sound of its own with sometimes silly, often genuinely heartfelt lyrics coupled with compelling composition and explosive instrumentation. 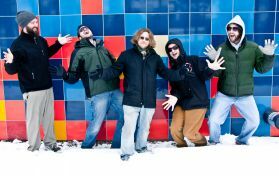 The music created by this five piece band from Grand Rapids, Michigan is progressively diverse, often switching between genres throughout the course of a show, sometimes even through the duration of a song. Their live shows have become an avenue for the band to build upon the core of their songs, exploring new ground, creating tension and taking risks for those moments of pure musical ecstacy, giving fans an original experience within every show.